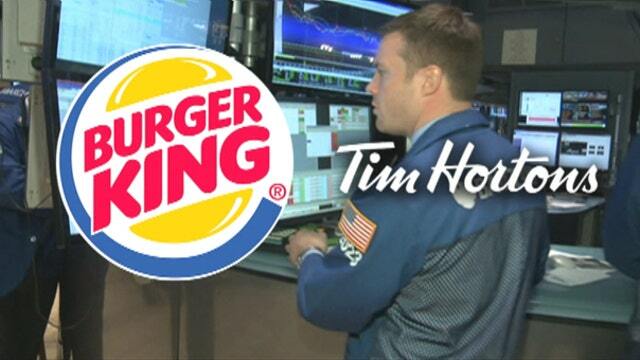 FBN’s Jo Ling Kent on Burger King in talks to buy the Canadian coffee and donut maker Tim Hortons. Burger King (NYSE:BKW) could lower its tax bill through a merger with Canadian coffee and doughnut chain Tim Hortons (NYSE:THI), though analysts say there’s more to the deal than the IRS. Burger King and Tim Hortons, comparable in size by market value, confirmed their merger discussions late on Sunday, saying the new company would be the world&apos;s third-largest quick service restaurant. It would be based in Canada, which has lower overall corporate taxes than the United States, especially for entities that have large amounts of earnings from overseas. The proposed deal would be structured as a so-called tax inversion transaction to move Burger King’s domicile out of the United States, and could come as soon as in the next few days, according to Reuters sources familiar with the discussions. Shares of Burger King leapt 21.3% to $32.88 in recent trading. Tim Hortons was up 21.4% at $76.26. Several inversion deals have developed just this year. U.S.-based AbbVie (NYSE:ABBV) secured an agreement to buy Irish drug maker Shire (NASDAQ:SHPG). Covidien (NYSE:COV), another company domiciled in Ireland, recently agreed to sell itself to Medtronic (NYSE:MDT). Big Mac attacked by the NLRB? Earlier this month, Walgreen (NYSE:WAG) said it will forgo a tax inversion when it completes a buyout of European drugstore chain Alliance Boots. “Burger King’s pursuit of an inversion only further underscores the arcane, anti-competitive nature of the U.S. tax code,” a Republican Senate Finance Committee spokesman said. A Treasury Department official said that while the best way to address inversions is through comprehensive business tax reform, “we cannot wait to act while inversions erode our corporate tax base.” Secretary Jacob Lew has asked Congress to pass legislation that would retroactively scrap inversion moves. The Treasury, which is also looking at ways Secretary Lew can stop or dissuade companies from completing tax inversions, declined to comment on the talks between Miami-based Burger King and Tim Hortons. Charles Kolstad, a tax attorney with Venable, said the recent string of inversion deals appear to be safe from legislative or regulatory action, at least until after the November elections. He recalled a period during the 1980s when the Treasury Department made three separate attempts to issue regulations differentiating between debt and equity. Those regulations were never finalized. “Even if you’re so inclined to take up regulations, it’s a complicated area,” Kolstad said. Kolstad added that policymakers need to draw a fine distinction when drafting rules for tax inversions. Tim Hortons initially kept its headquarters in Delaware after it was spun off by Wendy’s (NYSE:WEN) in 2006. The chain moved back to Canada in 2009, shortly after the Conservative government in Canada lowered the nation’s corporate tax rate. While the new publicly traded company would be based in Canada, Burger King and Tim Hortons would operate as standalone brands. Shared corporate services would provide cost savings, the companies said in a statement. KPMG ranked Canada first among 10 countries for general tax competitiveness this year, saying tax costs in Canada are 46.4% lower than the U.S. The U.S. has federal corporate tax rate of 35%. Including Canada’s 15% rate, Ontario has a provincial corporate tax rate of 26.5%. “People continue to look at inversions because it makes sense from a shareholder value perspective,” Kolstad said. Aside from the tax implications, Morgan Stanley analysts believe overseas growth is the primary motivation behind Burger King’s interest in buying Tim Hortons. Burger King’s overall effective tax rate was 27.5% in 2013, according to its annual report. Tim Horton is expected to book a tax rate of 29% this year. Burger King said its experience in building a large global footprint would allow it to help accelerate Tim Hortons’s growth in international markets. Under the stewardship of new chief executive Marc Caira, Tim Hortons recently posted results that beat analyst estimates, as moves to introduce new, pricier menu items helped boost profits. The chain, which has struggled with a U.S. expansion in recent years, is fending off mounting pressure on its home turf from well-capitalized rivals such as McDonald’s (NYSE:MCD) and Starbucks (NASDAQ:SBUX). At the end of last year, Burger King reported having 6,231 international system-wide restaurants—both company-owned and franchise locations. Burger King, which operates in nearly 100 countries, had 7,436 restaurants in the U.S. and Canada. Oakville, Canada-based Tim Hortons has more than 3,500 locations in Canada and 850 in the U.S.
John Glass and Jake Bartlett, the analysts at Morgan Stanley, said an effort by Tim Hortons to expand internationally has been slow to ramp-up. The brand could leverage Burger King’s growth overseas. Burger King “has built an expansive network of high quality international franchisees,” the analysts wrote in a research note to clients. Burger King may also see an opportunity to turn Tim Hortons into an “asset-lite royalty income stream,” a strategy that worked for Burger King. Under the ownership of 3G Capital, Burger King refranchised nearly all of its stores over the last two years. “Though [Tim Hortons] is all franchised, it still [employs] an asset-heavy model which could be altered over time,” Glass and Bartlett wrote. 3G, which purchased Burger King four years ago for $3.3 billion, would continue to own the majority of shares in the combined company. Burger King was taken public again in 2012. Reuters and FOX Business reporter Rich Edson contributed to this report.